The company's study shows a very strong preference towards passive technology. According to a study arranged by LG and carried out by market research firm Morpace, there is an incredibly strong consumer slant towards passive 3D technology. 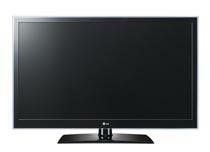 The test compared a few different sets from Sony and Samsung with a Cinema 3D passive television from LG. The results favored LG's set strongly. Around 80 percent of respondents chose the LG over either the Samsung or Sony. "We developed LG Cinema 3D to solve the problems consumers were experiencing with active 3D and to provide the best 3D experience in the home," says LG CEO Wayne Park. "With its outstanding picture quality, affordability, and easy-to-use and share glasses, it's no surprise that LG Cinema 3D technology is preferred by four out of five of consumers." You can check out the full test at LG's site. Keep in mind, LG organized the test and picked the TVs used for it, so things may not be all that they seem.